It’s Sunday so it’s time for this week’s lessons. I have a newsletter and you can sign up here (or in the bar on the right). There’s a Short Fiction Writers Guild and they have a website here. Google have investigated the feasibility of building space elevators and hoverboards and in the process made GoogleX the one place every nerd on the planet wants to work. 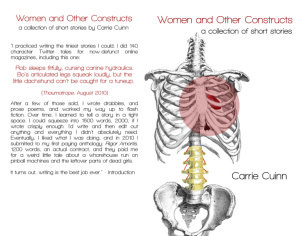 Carrie Cuinn is giving away digital versions of her collection of short stories but only until the end of the month. The robot apocalypse is nearer than we think.